Shortly before his wedding, the unnamed hero of this uncommon romance is visited by a man who claims to be his future self and ominously admonishes him that he must not marry the love of his life, Q. At first the protagonist doubts this stranger, but in time he becomes convinced of the authenticity of the warning and leaves his fiancée. The resulting void in his life is impossible to fill. One after the other, future selves arrive urging him to marry someone else, divorce, attend law school, leave law school, travel, join a running club, stop running, study the guitar, the cello, Proust, Buddhism, and opera, and eliminate gluten from his diet. The only constants in this madcap quest for personal improvement are his love for his New York City home and for the irresistible Q. 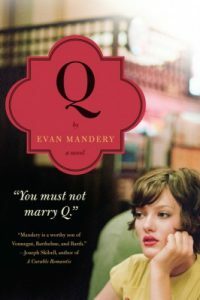 A unique literary talent, Evan Mandery turns the classic story of transcendent love on its head, with an ending that will melt even the darkest heart. This novel seems to be narrated by the author himself because the narrator is never mentioned by his name. The genre of this novel is science-fiction, a time-travel love story. He invented a character whose name was Quentina Elizabeth Deveril, known as Q, an incredibly beautiful, flawless and a kind woman. I love that the premise was set in contemporary New York which the author could have written various scenarios within the set, perhaps about Q because Q is barely in this novel, given the novel is named Q. Q is only in the beginning and at the very end of the story. The title is sort of misleading but I wouldn’t want to elaborate longer about that. I want to talk about how the narrator was visited by his future self one day. He was told by the older version of himself that he must leave Q or else he will be faced with a lot of awful fates. This novel makes us question our present time decision. Would we change our decision if we meet out future self and knowing what will happen in the future? Of course, there will be consequences if we mess with time-travel. Imagine if your life journey is supposed to go to A but if you decide to go to B, it will mess up the universe and various awful scenarios would be happening. The narrator didn’t seem to realize this at first. Do you think he will realize about the consequences and make the right decision or will he still be listening to his future self and keep going down the B road? If you wanna know how the ending would be, you can buy the eBook now!